In honor of Dorie Greenspan’s birthday today, the French Fridays crew is having a virtual birthday party. I love birthdays, anyone’s birthday! And who doesn’t like an excuse to celebrate? This week, I’m visiting my sister for a couple days. My niece Rachel and I baked cupcakes for the occasion. 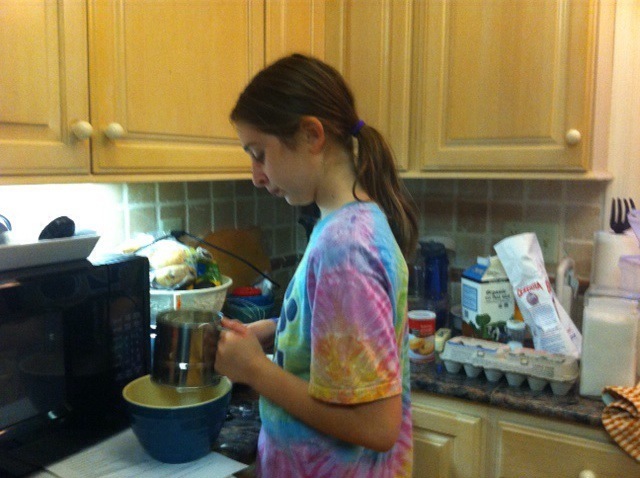 Rachel, age 11, is an accomplished and enthusiastic cook. 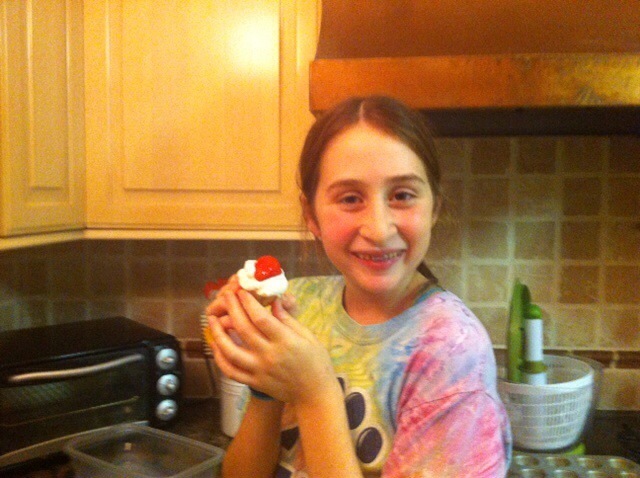 She’s been working on perfecting strawberry cupcakes so that’s what we made, in miniature. The cupcake batter has strawberry purée in it, giving it a lovely light pink hue. Rachel likes to frost them with whipped cream and top them with a strawberry, like a strawberry shortcake in cupcake form. Everyone got in the act. My sister Jennifer was in charge of piping the whipped cream. It looked very professional. HAPPY BIRTHDAY, DORIE, from Betsy and Rachel! We hope you have a fabulous day! Preheat the oven to 350F. Line a mini-muffin tin (with 24 muffins) with cupcake lines and set aside. Puree strawberries in a food processor. Measure out 1/3 cup of puree. Mix the puree in a small bowl with the milk and vanilla. In a medium bowl, whisk together sifted flour, baking powder and salt. In the bowl of an electric mixer fitted with the paddle attachment, cream the butter on medium-high speed until light and fluffy. Gradually add the sugar and continue to beat until well combined and fluffy. Reduce speed and slowly add egg and egg whites until just blended. With the mixer on low, slowly add half the flour mixture, mixing until just blended. Add the strawberry mixture; mix until just blended. Add the remaining flour mixture, scraping the sides of the bowl as needed, until just blended. 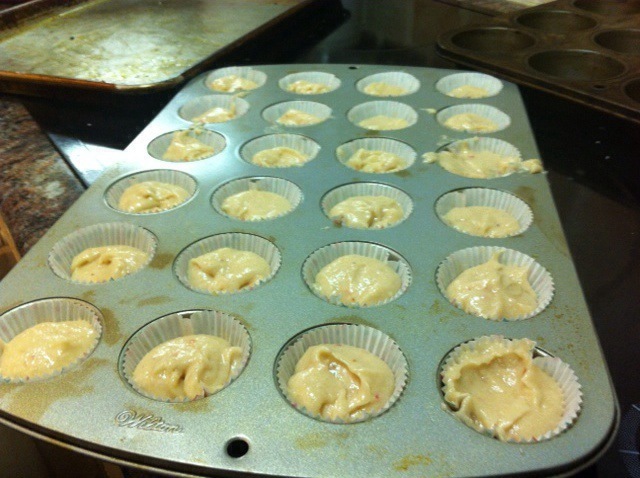 Divide the batter between the muffin cups, filling just 2/3 full. If there is extra, make a few full-sized cupcakes. Transfer the muffin tin to the oven, and bake until the tops are just dry to the touch (and the inside of the cake is cooked). 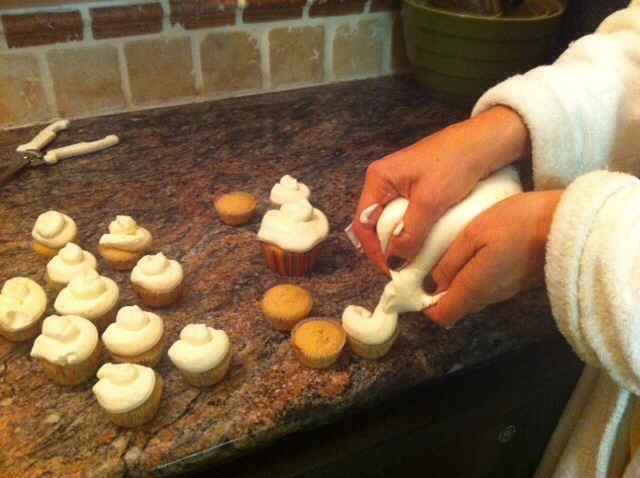 For mini-cupcakes, bake for 15-20 minutes. For full-sized, bake 22-25 minutes. Transfer muffin tin to a wire rack and cool completely before icing. When cooled, ice with whipped cream and top with half a strawberry. Enjoy!